1 Mak JM. Oncology nursing: Professional development as a clinical specialty in Hong Kong. J Adv Nurs 1997;26:1086-90. 2 Mak SS, Molassiotis A, Wan WM, Lee IY, Chan ES. The effects of hydrocolloid dressing and gentian violet on radiation-induced moist desquamation wound healing. Cancer Nurs 2000;23:220-9. 3 Mun LY, Ping CM, Fai WK, Alexander M, Ki TY, Jing CS, et al. 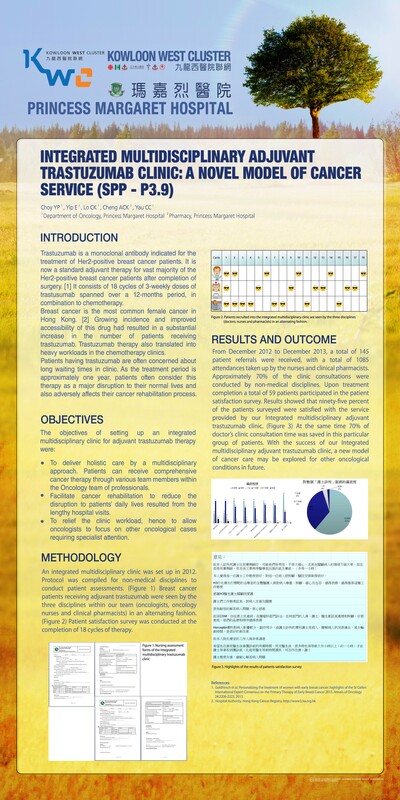 An evaluation of the quality of a chemotherapy administration service established by nurses in an oncology day care centre. Eur J Oncol Nurs 2001;5:244-53. 4 Lee YM, Mak SS, Tse SM, Chan SJ. Lymphoedema care of breast cancer patients in a breast care clinic: A survey of knowledge and health practice. Support Care Cancer 2001;9:634-41. 5 Mak SS, Zee CY, Molassiotis A, Chan SJ, Leung SF, Mo KF, et al. A comparison of wound treatments in nasopharyngeal cancer patients receiving radiation therapy. Cancer Nurs 2005;28:436-45. 6 Mak SS, Yuen ML, Li C, Chan YK, Mo KF, Lee KM, et al. Explorative analysis for bacteriological status of post-irradiation wound and relation to healing. Clin Oncol 2006;18:519-24. 7 Mak SS, Yeo W, Lee YM, Mo KF, Tse KY, Tse SM, et al. Predictors of lymphedema in patients with breast cancer undergoing axillary lymph node dissection in Hong Kong. Nurs Res 2008;57:416-25. 8 Lee YM, Hung YK, Mo FK, Ho WM. Comparison between ambulatory infusion mode and inpatient infusion mode from the perspective of quality of life among colorectal cancer patients receiving chemotherapy. Int J Nurs Pract 2010;16:508-16. 9 Mak SS, Mo KF, Suen JJ, Chan SL, Ma WL, Yeo W, et al. Lymphedema and quality of life in Chinese women after treatment for breast cancer. Eur J Oncol Nurs 2009;13:110-5. 10 Central Oncology Committee Integrated Care Programs Department HAHO. Cancer Case Manager Program Operation Manual. Hospital Authority Head Office; August, 2011. 11 Chan E. Advancing Nurses Contribution through a Clinical Career Pathway. College of Nursing 50th Anniversary Nursing Conference; 2014. 12 Mak SS. How quality of oncology care and services be improved through leadership and collaborations: Cross-clusters CQI program in Hong Kong. Asia Pac J Oncol Nurs 2016;3:352-6. 13 Hospital Authority. Outstanding Hospital Projects won 5 HMA Awards. HAS Link; September, 2019. Available from: http://www3.ha.org.hk/ehaslink/issue94/en/news-01.html. [Last accessed on 2018 Jul 26]. 14 Lee SW. Review of Hospital Authority Nurse Clinic. HA Convention 2017. Proceedings Parallel Session PS3.3; 2017. Available from: http://www3.ha.org.hk/haconvention/hac2017/proceedings/downloads/PS3.3.pdf. [Last accessed on 2018 Jul 26]. 15 Liu TK. Chemotherapy Nurse Clinic in Contributing the Clinical Pathway for Managing Post-treatment Complications with Improved Outcome. Hospital Authority Convention 2017. Proceedings Parallel Session PS3.1; 2017. Available from: http://www3.ha.org.hk/haconvention/hac2017/proceedings/downloads/PS3.1.pdf. [Last accessed on 2018 Jul 26]. 16 Ling WM. The Challenges in Development of Effective Nurse Clinics. Hospital Authority Convention 2014. Proceedings Parallel Session MC9; 2014. Available from: http://www3.ha.org.hk/haconvention/hac2014/proceedings/downloads/MC9.pdf. [Last accessed on 2018 Jul 26]. 17 Choy YP. Integrated multidisciplinary adjuvant trastuzumab clinic: A novel model of cancer service. Hospital Authority Convention 2014. Proceedings Poster Session SPP-P3.9; 2014. Available from: http://www3.ha.org.hk/haconvention/hac2014/proceedings/downloads/SPP-P3.9.jpg. [Last accessed on 2018 Jul 26]. 18 Hospital Authority. Nurse Clinics Migrate to Integrated Model. HAS Link; 16-17 January, 2018. Available from: http://www3.ha.org.hk/ehaslink/issue96/en/news-03.html. [Last accessed on 2018 Jul 26]. 19 WHO. Cancer Fact Sheet, Centre for Health Protection HK, Vital Statistics. WHO; February, 2017. 20 HK Cancer Registry, Overview of Hong Kong Cancer Statistics of 2014. Available from: https://www3.ha.org.hk/cancereg/pdf/overview/Summary%20of%20CanStat%202014.pdf. [Last accessed on 2018 Jul 26]. 21 The Chief Executive's 2017 Policy Address. Available from: https://www.policyaddress.gov.hk/2017/chi/policy_ch05.html. [Last accessed on 2018 Jul 20]. 22 National council of state boards of nursing. J Nurs Regul 2017;7:4 Suppl:S2-36. 23 Parker J, Hill MN. A review of advanced practice nursing in the United States, Canada, Australia and Hong Kong SAR, China. Int J Nurs Sci 2017;4:196-204. 24 Hong Kong College of Medical Nursing Limited. Available from: http://www.hkcmn.com/web/index.asp?Lang=en& Page=Info_AboutUs. [Last accessed on 2018 Jul 26]. 25 Lennan E, Vidall C, Roe H, Jones P, Smith J, Farrell C, et al. Best practice in nurse-led chemotherapy review: A position statement from the United Kingdom oncology nursing society. Ecancermedicalscience 2012;6:263. 26 Principle Statement: Shared Care. Cancer Research in Primary Care; February, 2016. 27 Victorian Cancer Survivorship Program: Pilot Project. Survivorship Program for Patients Completing Definitive Breast Cancer Treatment Final Report; 2014.